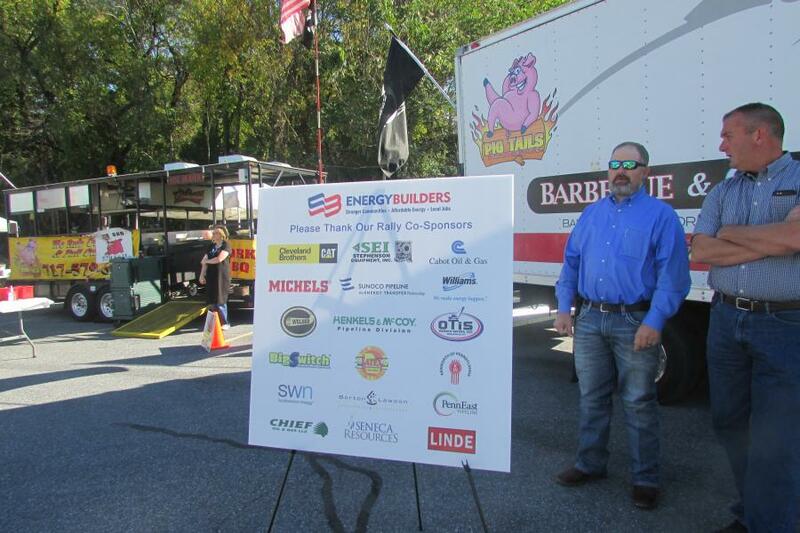 Industry stakeholders gather to show their support at Cleveland Brothers beneath co-sponsor Stephenson Equipment’s 500-lb. American flag, held up by two Allison Crane & Rigging cranes. 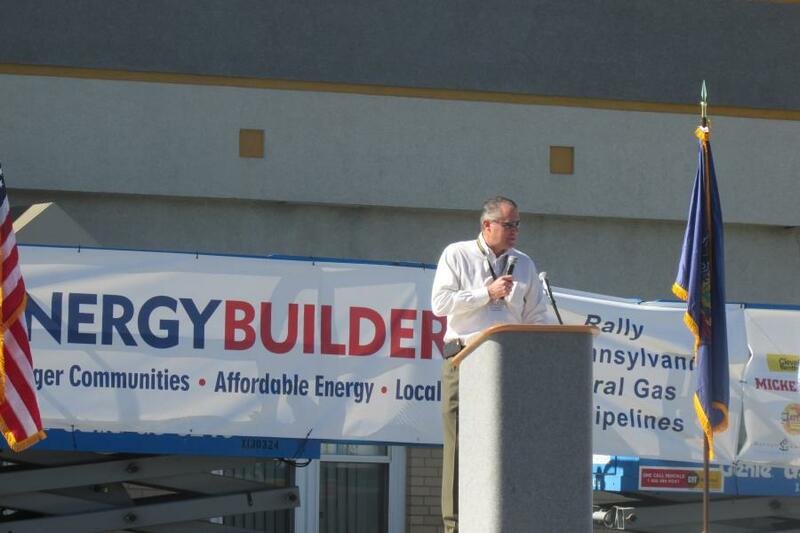 It was a beautiful day for a rally at Cleveland Brothers Equipment Co., in Harrisburg, Pa., where hundreds of industry professionals and stakeholders gathered together Oct. 19 to show their support at the Energy Builders Rally of Pennsylvania Energy Infrastructure. 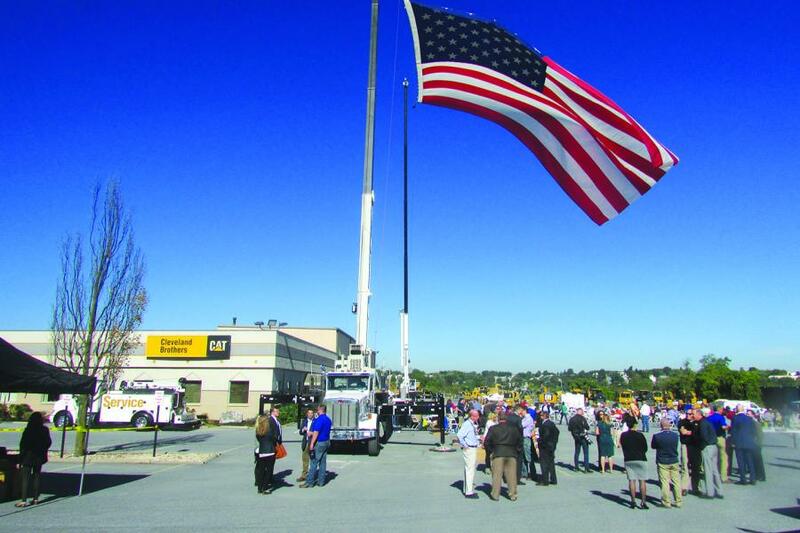 Over a lunch catered by Pig Tails Barbeque, supporters listened to impassioned speeches from state senators and representatives, industry leaders and others beneath the backdrop of an enormous American flag, donated for the day by event co-sponsor Stephenson Equipment. For Jay Cleveland, president and CEO of Cleveland Brothers, the impact the oil and gas business has had on the company is clear. “Jobs, jobs, jobs,” said Cleveland to the crowd. Cleveland Brothers, he said, is involved in all aspects of energy infrastructure, from installing pipelines to compression work, maintenance to machining. “It's been a tremendous boost for our company and our people,” said Cleveland. But the benefits of the oil and gas business reach far beyond the industry itself, Cleveland pointed out. Toby Mack, CEO of the Energy Equipment and Infrastructure Alliance (EEIA), the group responsible for putting together the Energy Builders Rally, said the event's goal was twofold. “We are trying to build public and policy maker support for pipelines, but we are also trying to energize, mobilize all of these people here, whose livelihoods depend on this work, to get into the game, because there is a lot of opposition, so we are there to provide that counter balance, that counter force, that counter choice to that opposition,” said Mack. “Everyone drives by this facility,” said Stark about Cleveland Brothers. “I drove by here every day. You don't know how many people are employed here and what happens here. The more we get people to understand that this is a major economic engine — and I don't think people give it the full credit that it deserves … that's the piece we enjoy talking about … and that is what we want to showcase — the advances and equipment, the knowledge level of the employees and the care. “The goal is to find your voice, speak about what it is that you know and you share that knowledge,” said Stark. But for Stark, encouraging industry professionals to speak out is only partially effective. The other key component is encouraging these individuals to register and vote for what they believe is right. “Not just one, but both,” said Stark. Jim Joy, industry sales manager at Cleveland Brothers, talked about the need for politicians to understand how the laws they make affect the industry long-term. Joseph Lundy, CFO of Cleveland Brothers, addressed the enormous growth the natural gas sector has seen in the last decade. “We have North America's largest gas shale plate here in Pennsylvania. If you talk to experts, 10 years ago, it wasn't even on the map, said Lundy. “In 10 years, we have this huge growth and it's going to outlive me, it's going to outlive you, and it's going to outlive all of us, because there is so much here. If you take all of the gas between 2012 and 2015 that was taken out of the six counties in northeast Pennsylvania, that gas in three years is enough to power all of Washington, D.C., for the next 60 years. “People don't realize the magnitude. It's huge,” Lundy said.